Nine participants enjoyed a quiet (i.e. not a lot of neat species seen) Wednesday morning of birding at the South Arm Marshes Wildlife Management Area (SAMWMA) and Ladner Harbour Park, before the shameful riots and the Canucks heart-breaking loss. 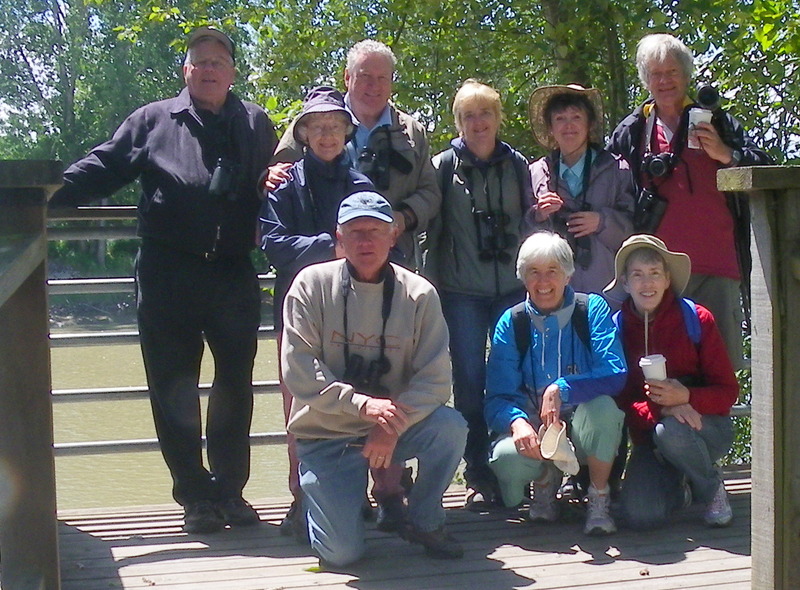 We (Lorna, Roger & Mike, Ken & Anne, Donna, Anne M., Eleanor and me) had gorgeous weather; the hi-lites were: several nesting parents feeding young (Northern Flickers, Downy Woodpeckers, Tree Swallows); Warbling Vireos and lunch and beer at Speeds Pub in Ladner. Check out our Group photo and other shots on our Picasa site at: http://picasaweb.google.com/dncbirding or our DNCB Blog at www.dncb.wordpress.com. Our first stop was Ernie Burnett Park on Ferry Road in Ladner across from the South Arm Marshes WMA. We were searching there for the nesting Pileated Woodpeckers, but only heard one. There was lots of evidence in the dead trees of them being there, but we could not locate their nest. 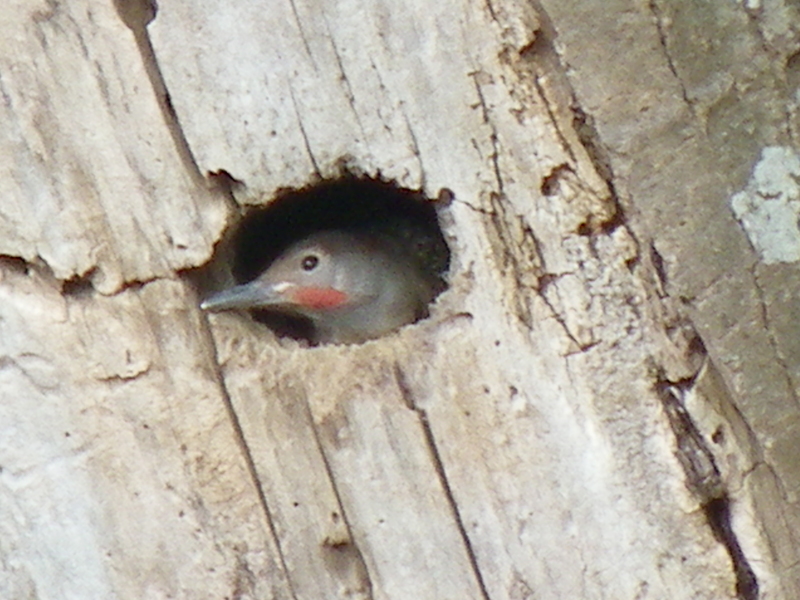 However, Lorna spotted one of two Northern Flicker heads sticking out a hole, and we later watched the parents coming to feed them. In the next dead tree a pair of Downy Woodpeckers was doing the same thing to their young. And in another dead tree (they were mostly Cottonwoods – so there is some use for these “dirty snow” trees that many folk despise) a few feet away a pair of Tree Swallows was feeding their young in another hole. In the creek below a Mallard went by with 9 two or three day old young. An adult Bald Eagle cruised by twice almost grabbing an adult male Wood Duck which dove just in time. We also saw Rufous Hummingbirds, Cedar Waxwings, three Swallow species (Barn, Tree and Violet-green), Brown-headed Cowbirds and pretty American Goldfinches in this little park. An interesting area. We crossed the road to enter SAMWMA and heard different Warbler species and managed to see a couple of nice adult male Yellow-rumped (Audubon). Some finally saw one of the noisy Warbling Vireos high up in the now heavily-leaved trees. The Lookout was quiet, but some saw the Red-tailed Hawk (I think it is a resident there). We also saw evidence of a recent youth Canuck party with a dozen or so beer cans and potato chip bags at a fire-pit near the river. At Ladner Harbour Park, Black-headed Grosbeaks and Marsh Wrens were singing everywhere, and some heard a Western Tanager. We were blanked on the Bullock’s Oriole and Ken’s Owl turned out to be a calling Eurasian Collared-dove. We almost enjoyed the view of the condos across the slough from the new weirdly-placed Lookout. So fittingly, we took our mandatory Group Shot there. Then we hurried back to our vehicles, past the dog pound and through the mosquito section, and went to Speeds Pub for a delicious lunch, a refreshing draught beer and the usual less-than-stimulating conversation. Don’t forget Family Day in the Park at Centennial Beach in Tsawwassen this Sunday morning (June 19) for the Pancake Breakfast and to see our Delta Nats Display booth. Next Wednesday, June 22, we/DNCB’s will leave Petra’s at 7:30 a.m. on an “away” outing to Pitt Lake Park, so will return in the early afternoon. Again, comments welcome, and tell me (again) if you’ve had enough of this trash.